Is there something seriously wrong with the Dubs? What happened in Croke Park on Saturday night gave football’s chasing pack hope. It also raised the expectations of football fans outside of Dublin that we might have a competitive summer on our hands following on from 2018’s procession. No one laid a glove on the Dubs on their way to winning Sam Maguire last year, but their path looks nothing like as smooth in the months ahead. The issue just doesn’t seem to be as cut and dried as it appeared to be only a few short months ago. So far this season they have lost three Allianz Football League Division 1 games - something that has never happened before on Jim Gavin’s watch, which stretches back to 2013. This will also be the first time in seven years that the Boys in Blue won’t feature in the Division 1 final. Defeat to 14-man Tyrone at the weekend in their own backyard confirmed that with a round of games to spare. These are far from crisis times in the capital, but there are chinks in the armour of the five in-a-row-chasing All-Ireland champions and they allow shafts of light to shine on the teams hoping to stop them. Monaghan, Kerry and Tyrone, in that order, beat the Dubs over the past few weeks. The Red Hand even went so far as to turn them over at GAA Headquarters - not something that happens very often. Mayo and Galway, two of the teams the Dubs did manage to beat during the springtime campaign, will also be thinking that they are in with a chance come the summer. So what exactly is going wrong? Well firstly, the chasing pack have upped their game. Kerry are certainly in a better place than they were 12 months ago and their defensive problems, something highlighted by Aidan O’Rourke in his RTÉ column, notwithstanding, they are shaping up nicely. Tyrone too appear to have evolved since last September’s All-Ireland final defeat. On Saturday they defended solidly and then hit quickly on the break, getting real joy from fast ball into their little and large inside forward line of Mattie Donnelly and Cathal McShane. Mayo are experimenting under James Horan in his second spell in charge, but they also are gathering a bit of momentum to go with their proven track-record as serious challenges. And while their pursuers have sped up, Dublin have also slowed down. Whether there’s a response when they press the accelerator when they need it later this year remains to be seen. It’s worth pointing out at this stage that the Dubs are strong and justifiable favourites to win the All-Ireland. If they do they may well go down as the greatest team of all time, achieving something never done before in a five in-a-row. 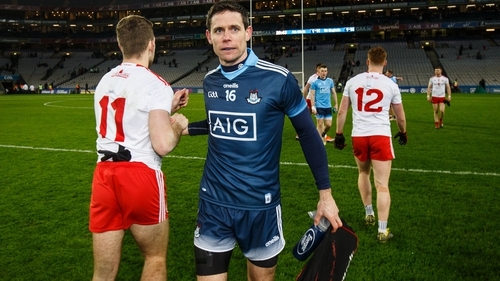 Since Rory O’Carroll departed the panel after the 2015 All-Ireland win, the first of their current four in-a-row, the Boys in Blue haven’t had a traditional full-back. The likes of Mick Fitzsimons, Jonny Cooper and Philly McMahon have all filled in on the edge of the square and acquitted themselves brilliantly. None of them though have offered a solution to their team’s vulnerability under a high ball into the danger zone - something that has been exploited this year. O’Carroll is back in the country after three years living in New Zealand and playing again for his club Kilmacud Crokes. David Byrne’s struggles on Saturday against McShane will further fuel speculation that Gavin will lift the phone and try to persuade his former number three to return. There have been injuries of course, and an apparent broken jaw suffered by Paddy Andrews not long after coming on as a substitute against Tyrone will further thin out Gavin’s resources. Key players, genuine stars of the game, the likes of Dean Rock, Ciaran Kilkenny, Cian O’Sullivan and others, haven’t been delivering the sort of dominant performances that were once routine. The urgency, the hunger and the desire to win every contest, every ball, every game isn’t there currently either. This hasn’t eluded Gavin and after the defeat on Saturday he did something he has never publicly done before as Dublin manager - he criticised his foot soldiers, saying: "That level of performance from the Dublin players certainly is not good enough – at this level you’ll be found out." Winning five in a row isn’t something that’s easy to do, history shows us that, and if the Dubs are to do it they’ll have to overcome quite a bit of adversity on the way in the coming months.